Hello cuties ! How are you? For me, as busy as never but i taking the time to change my hair color again because i've bored to looking brown or blonde color. I've required a big struggle to get this color. I give the name "Ash Navy" for my new hair color. In outdoor the color look ash violet but when indoor the color look ash navy color hahahaha . What do you think about my new hair color? 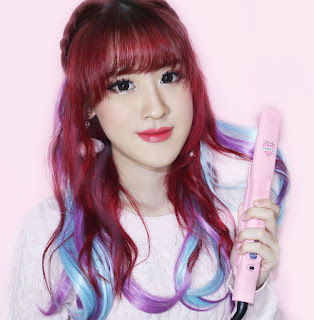 My mother don't like my new hair color coz she said pink color better for my face lol , but all my friends say love this color . Okay, Back to topic! Today i'll review a adorable T-shirt from Juizy Woozy. Juizywoozy is a leading brand in fashion trend where kawaii things from Indonesia, made in a fresh way beyond limitation . An innovative line of apparel, bags, accessories and more, juizywoozy has built a worldwide following with its larger-than-life characters and designs. The owner is so kind because their help me when i need internship for my assignment. I've a some Juizy Woozy products in my room because their products super quirky and super cute . 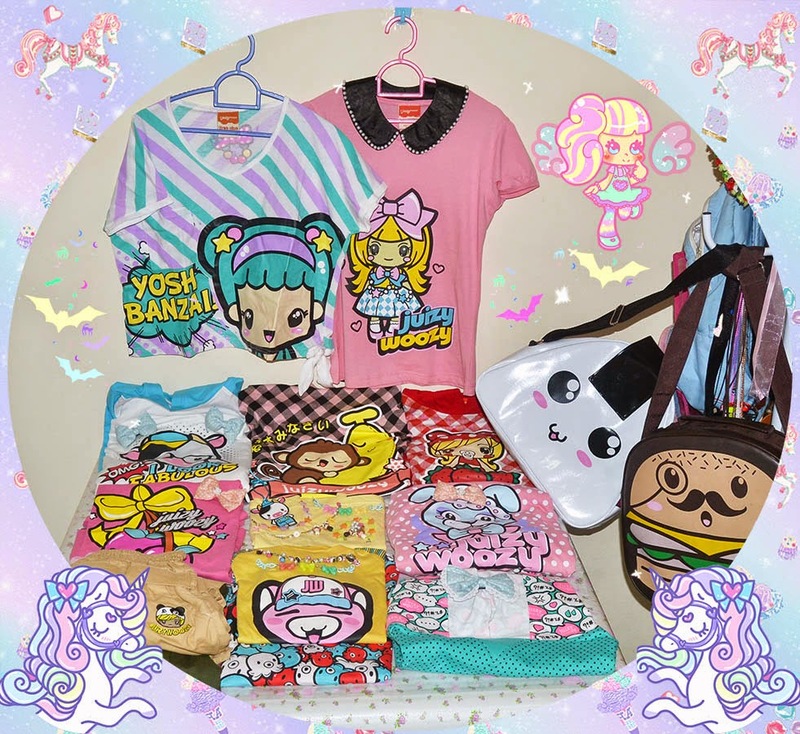 If you like Kawaii Culture, you must check out their shop! I really recommend for all because they open ship worldwide. I love a cute bunny on this T-shirt and puffy models on sleeve . The pastel colour mix white polka dot, This adds more kawaii in this T-shirt. Beside that, the quality is good, the stitching is good, the materials, the style, everything is perfect. Their collection are ready to wear, casual, but super kawaii. And for all their t-shirt collection, they are all 100% cotton. I love everything from their collections and of course I wish I cold buy them all hahaha! T-Shirt, Bag, and Accessories from Juizy Woozy. Their collections look super kawaii! Anyone agree with me? Don't forget to check Juizy Woozy facebook page . Okay, I think that's all for today's review and see you later on my next blog post. Kisses, Bye-bye . Your bag onigiri is soooooooooooooooooo cute ^^ Perfect!! Amazing hairstyle and hair colour Miss! perfect <3 you are so cute and I love your hair !!! You look like so cute!!. I really love your cuteness! Great outfit poast! Cool sweater and Lovely hairstyle! Love, LOVE your style!! Love the outfit! You're stunning! Love your tee! That hair color really becomes you! And that shirt is really cute! Your bag is so funny! Cute outfit, the bag is so fun and cool. You have amazing style! I adore your hair and I love these sneakers! Thank you for your sweet comment. I would love to follow each other. Following you now! Have a great day! Really cute top! I'm in love with your new hair color - it's so pretty! and your hair looks awesome. love your bag and hair!! you look so pretty & lovely!! your look is so sweety!! and love this bag!! Thanks for your comment, you blog is nice. I love your style doll!! You're amazing! That bunny is super cute darling! you look so lovely! I love your new hair colour! would you like to follow each other on GFC and like FB page? If yes, pls follow/like and let me know; I will follow back asap! OMG, its so adorable , N i want it too. awesome hair color! you look so cute!